The need for an air conditioning unit in the British winter might seem counter-intuitive at first glance. However, come peak summer, an air conditioner becomes almost necessary to brave the season’s hot and stuffy weather. When you cool your home down, it is much easier to get a good night’s sleep even when the temperature outside is ridiculously high. We could go on and on about the benefits of cooling your home in the summer but you get the point, right? 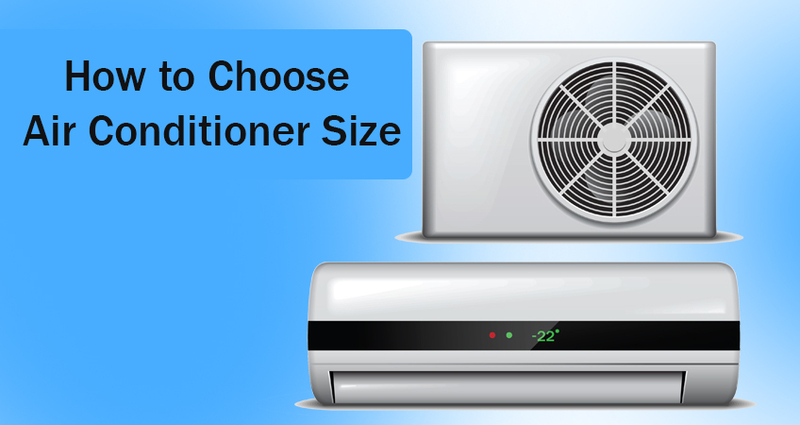 Since we’ve already agreed how essential air conditioners are in summer, now comes the more difficult part of choosing the right size for your cooling requirements. Many homeowners find themselves confused when it comes to picking the right air conditioner size for their rooms. This guide briefly touches upon the different types of air conditioners available and how to pick the right air conditioning unit for your room or home. The former is important as both types of air conditioners are different from each other in terms of cooling power, size and mode of installation. Without further ado, let’s get going. You can choose between two types of air conditioners. Single-unit air conditioners are moveable and need access to either windows or other similar openings to vent the heat out from. Split-unit air conditioners, on the contrary, are permanently mounted onto the wall. There are advantages and disadvantages to both types. This type of air conditioner is very easy to install. This is why most tenants prefer to use single-unit ACs. Single-unit air conditioners are also cheap to buy and run. If you want to cool your room at a low cost, single-unit ACs are just perfect. In this AC, the hot air is vented out via a hose. This means you can shift the air conditioner to whichever room you want. Portable single-unit air conditioners have below-par cooling performance, especially when compared to split-unit air conditioners. Single-unit ACs also tend to heat up and leak some of that heat into your room. There is a security risk to venting the air conditioner’s hose through the window which needs to be kept open. Certain brands of single-unit ACs are too heavy, which severely reduces their portability. A split-unit air conditioner is ideal if you want to cool just one room in your home that gets too hot. These air conditioners provide a safer way of cooling your home as they don’t need the windows to remain open. Split-unit air conditioners are more powerful, more efficient and quieter than their single-unit counterparts. Split-unit air conditioners are costlier than single-unit air conditioners. They must be installed permanently to one of your home’s outside walls. It is a complicated process and cannot be done on your own. It is also costly if you move from one house to another often. The BTU, or British thermal unit, is the most important metric you need to know when out shopping for an air conditioner for your home. BTU is the measure by which air conditioners differ from one another. The higher an AC’s BTU rating, the better and faster it is supposed to be at cooling a room. At least that is how it works in theory. In practice, however, only a handful of air conditioners match up to their advertised BTU figures. That is why the BTU number, although important, should not be the sole criterion for your air conditioner purchase. Although a higher BTU rating signifies a faster speed of cooling, an air conditioner with a BTU rating of between 5,000 and 8,000 BTUs can adequately cool most bedrooms and living rooms. There is also an air conditioning calculation formula that you can use to find out what BTU-rated air conditioner you need to buy. You can arrive at an approximate BTU figure by multiplying the dimensions (in feet) of your room by five. So, if your room measures 15 x 10 x 7 (in feet), you’ll need an AC rated at, (15 x 10 x 7) x 5 = 5250 BTUs. The formula is useful when you need to pick one among several air conditioning unit sizes. However, it is only an approximate way of calculating the right air conditioner size you need. There are other factors that should be kept in mind too when buying an air conditioner. For instance, if your house is in an area that gets heavy sunshine or your bedroom is such that it suffers from poor ventilation, you’ll need an air conditioner that is more powerful than what the above calculation would tell you. In fact, many buyers prefer to go one size up when buying an AC just to be on the safer side. If you need more help with choosing the right air conditioner size or need your existing air conditioner repaired or installed, give us a call. Christy Cooling has been in the air conditioner business for more than 30 years and offers air conditioner full design, air conditioning installation, service calls, preventive maintenance and repair services in Essex and London.